Looking for more restaurants in Paris? Don’t miss out on getting a copy of our Paris Night Guide where we share a long list of our favorite restaurants in the city! If you’re spending this Christmas period in France, we know how important it can be to find a good Christmas dinner in Paris! If you’re looking for a Christmas Dinner cruise, somewhere to eat on Christmas Eve in Paris or even for a Christmas lunch in Paris, you have lots of options! 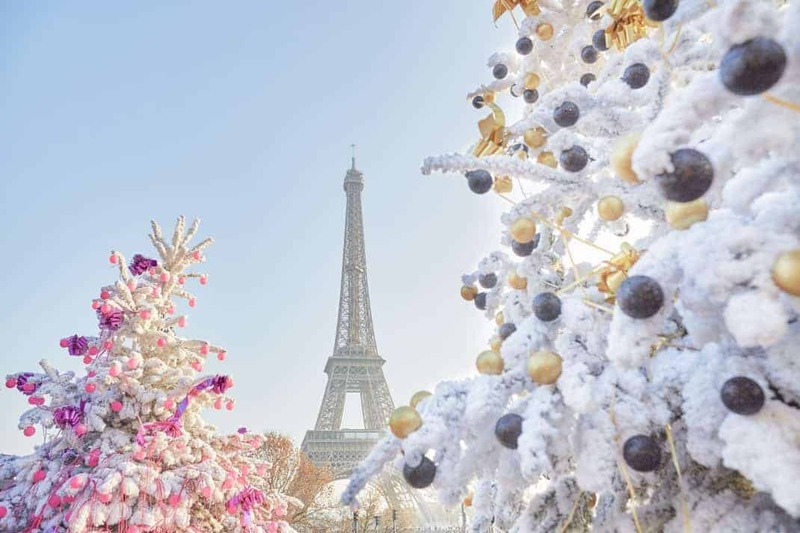 Some of the most famous river cruises in Paris are offering a different option for you to enjoy your Christmas in Paris. Including Christmas Eve lunches and dinners and dining out on Christmas Day itself! The Bateaux Parisiens is a great Parisian boat cruise which are offering a Christmas Eve Dinner Cruise and a Christmas Day Lunch Cruise. Costing €145 per person for Christmas Eve, the cruise lasts around 2 and a half hours and costing a lower price of €85 per person or €39 per child on Christmas Day which lasts 2 hours. Both services include a full complete menu, with a welcome glass of champagne and live entertainment. There are more options for pricing depending on where you want to sit and they have a large selection of fine wines on offer. It starts at 8.30pm on the 24th of December and 12.45pm on the 25th. One of the most famous river cruises, the Bateaux-Mouches is inviting families to experience a Christmas Day lunch cruise. In their glass-paneled boats, you’ll be able to enjoy a spectacular moving panorama of Paris and it’s monuments in a family-friendly atmosphere. Their special Christmas menu includes a bottle of wine between 2 people and a full delicious menu including cheeses, foie gras, and stuffed free-range chicken. Prices are €90 per person and €55 per child with a childrens menu. It starts boarding at 12.30pm and lasts until 2.45pm! If you’re looking to find a great restaurant to eat at for Christmas Eve in Paris it can be tricky but there are a few options! A great central location for Christmas dinner on Christmas Eve in Paris is L’Opera restaurant! At 88€ per head, it’s an option which is not too incredibly pricey, they can also offer a vegetarian option on request. The Four Seasons George V hotel is home to Le Cinq restaurant, a up-market fancy establishment! For the staggering price of 700€ you can get their special Christmas menu and eat while listening to live jazz quarter, head over between 3.30pm and 6.30pm to enjoy a gospel choir too! For a €105 per person, you could enjoy the Christmas menu at Lucas Carton. For this price you can enjoy their Amuse-bouche, Foie Gras terrine, Brioche and Citrus fruit, Stewing farm hen with seasonal vegetables with truffle, their “Sweet Clementine Interlude”, a Yule Log Cake “to share” and finally a coffee with Petits Fours! Les Ombres is an INSIDR favourite in terms of restaurants and this year they are offering a lovely Christmas menu for all to enjoy while taking in a breath-taking view of the Eiffel Tower! A little bit more pricey at €170 per person but definitely worth the high class level of food! More of a seafood themed meal but their creamy truffle risotto is a must have! Christmas day in Paris is a little bit more tricky with places to eat but there are a range of restaurants open which serve a Christmas lunch, a Christmas menu or normal traditional French food! This Michelin starred restaurant is one of the best restaurants in Paris, with their prices only slightly higher than a traditional brasserie, it’s a must try! On Christmas Day and Eve they are offering an exquisitive tasting menu for €150 per person which isn’t too bad for such incredible food! This high class French cuisine restaurant is offering Christmas festive options for lunch and dinner with no fixed menu. Expect prices of €100+ but the food is absolutely incredible! This exquisite dining establishment is hosting a festive menu from the 19th of Decemember, offering a 5 course meal of €170+ depending on what options you select. They also offer to host private groups of 10+ people for a different rate and different options. If you’re not celebrating Christmas or want a more relaxed feeling, you can go to one of our INSIDR favourites. Café Constant offer modern French cuisine at competitive prices and the staff are lovely. Their food is delicious and the atmosphere will be sure to make it special, even if you’re not festive! Or head over to Bofinger, a traditional French brasserie that are offering a festive set menu at noon on the 25th of Decemember. Competitive prices and choice of foods make this a nice relaxed place to spend your Christmas!